This is not for the faint of heart. This is not for the sort-of hungry. This is not for the “I’ll just have a salad” crowd. This is for the strong-stomached, for the strong-willed. For the meat connoisseur. For those who don’t mind getting messy, and for those who aren’t afraid of carbs or calories. 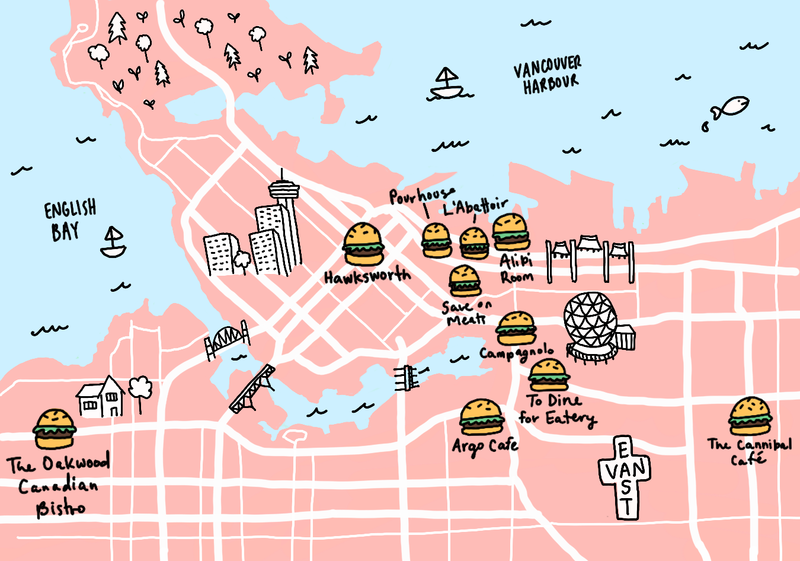 This is The Great Vancouver Burger Crawl. It may take weeks or even months to complete, but follow this map and find yourself in burger heaven. Want to hear a joke? Ordering salad at The Cannibal Café. Sure, this Commercial Drive institution has greens on the menu—but if you order them, you’re doing it wrong. Burgers reign supreme here, from the Bacon Bad (applewood smoked bacon, cheddar, maple bacon bourbon jam, and roasted garlic mayo on top of a patty stuffed with bacon and cheddar), to The Steve Martin “The Jerk” (pork patty topped with pickled red onions, ginger garlic, green onions, house-made jerk sauce, chilli ketchup, and pineapple salsa). These are juicy, messy, can’t-put-them-down-for-risk-of-falling-apart burgers, and that’s how they should be. Bonus tip: order a milkshake and add bourbon for the ultimate diner experience. Perhaps the most unassuming spot on this crawl is To Dine For, a humble if not downright basic eatery in a strip mall on Terminal Avenue just east of Main Street. Here, a very pared-down dining space lets the house-made patties really shine: everything from a Korean Kimchi Burger (homemade kimchi, mozzarella) to a PB & Bacon Burger (smoked bacon bits, peanut butter) is served hot and quick with a side of salad or salty fries. Grab extra napkins for these oozy, drippy mouthfuls. Ah, the Argo: a Vancouver institution. This curious diner is only open for lunch, but it’s worth leaving the office for. 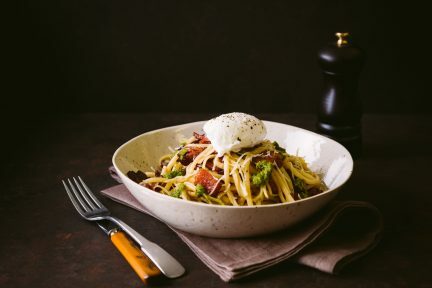 With a rather unique menu that offers everything from stir fry to minestrone soup, the Argo is a bit of an enigma. There is plenty of fun to be had with the burger, though: choose from a beef patty or chicken, and add whatever array of toppings suits your fancy: fried onions, bacon, cheese, mushrooms, even avocado. Order a side of fries and a cup of gravy for dipping, and revel in the fact that a starter cup of soup comes complimentary with every meal. Long lauded as Vancouver’s best, the Dirty Burger from Upstairs at Campagnolo still deserves a place on this meat map. Not the most beautiful of the bunch to look at, the Dirty Burger excels in its simplicity—think of it as a high-quality Burger King. A squishy house-made bun, iceberg lettuce, tomato slices, house-made pickles, and a patty made from dry-aged prime beef neck? Now that’s what you call a whopper. Gastown’s L’Abattoir is known for its brunch, and rightly so—one sample of the house-made scones is all it takes to become a believer. But the brunch burger is also something to write home about: a quarter-pound patty is topped with a fried hashbrown patty and fried egg, and slathered with a creamy aioli. This burger comes without any sides, but don’t let that fool you: it’s a small but mighty dish that will fill you right up. Pourhouse is one of those classic establishments that delivers consistent quality and charm. It’s hard to go wrong with the menu here, but the burger is always a good choice. The patty, a combination of brisket and chuck beef, is incredibly thick, big, and juicy. Topped with deliciously crunchy pork belly, smoked cheddar cheese, caramelized onions, mayonnaise, and mustard, this burger is high-end and high-power. The grilled house-made bun is soft and chewy, almost like a ciabatta—and it’s all served with a side of perfect fries. Pair with an expertly prepared spirit-forward cocktail. When everyone’s favourite frosted-tip television personality Guy Fieri visits a diner, you can rest assured that it serves up next-level greasy goodness. The legendary Save On Meats was popular long before Diners, Drive-Ins and Dives, though, and it remains popular long after it appeared on the show in 2011. The burger is modest and delicious: a fresh-ground patty with American cheese (though you can sub for Swiss or aged cheddar), tomato, lettuce, pickle, and onions, plus a secret house sauce. 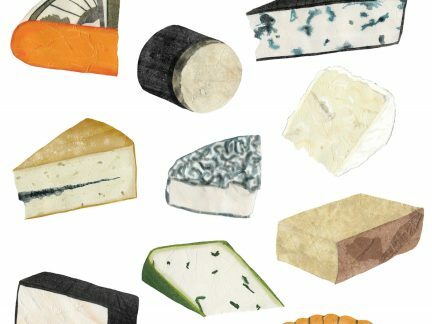 Add bacon, and go for a side of salt-and-pepper fries or a house salad. Order with a pint of whatever Persephone beer is on tap at the time, and bask in the amazingly retro decor. Hawksworth’s burger is the longest-standing item on the restaurant’s excellent menu. While the other dishes change and rotate with the seasons, the burger remains on it no matter what, because guests refuse to see it go—and it is not hard to understand why. The meat is ground in-house, which, amazingly, allows diners to choose how they want the burger cooked. Also done in-house is the sauce and the bun, the latter of which never gets soggy or soft under the weight of the meat. Topped off with aged cheddar and smoked bacon, and served with a side of fries and both ketchup and mayo for dipping, the Hawksworth burger is the ultimate in luxury. Word to the wise: it is only available in the Hawksworth dining room at lunchtime; at dinner (or throughout the day), find it at the restaurant’s adjoining lounge. Tucked away on 4th Avenue at MacDonald is The Oakwood, which celebrates modern Canadian cuisine. Particularly hungry diners could start with the seared albacore tuna to share, and then move on to the sumptuous burger with bacon, aged cheddar, alfalfa sprouts, garlic dill pickles, and Gulf Islands dressing. It’s an upscale burger with a West Coast twist. There is no hamburger on AnnaLena’s menu, but for one night only, to celebrate the Kitsilano restaurant’s second anniversary, a limited number of knock-your-socks-off burgers were served to lucky and devoted guests. Everything was made in-house: the flavourful patty, the warm bun, the tangy pickles. Burger lovers should cross their fingers that AnnaLena decides to celebrate its third birthday the same way. While sadly not discovered in time to make it onto this map, Trans Am must be added to any burger-lover’s quest. 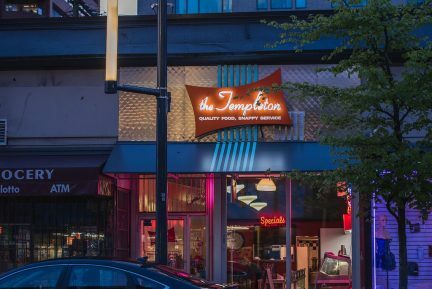 Located on Powell at Victoria, this tiny spot (there are just a handful of bar seats) is only open in the evenings and serves up a small but expert menu of cocktails. Oh, and the burger: it is basically the only food item (there is a vegetarian option sometimes, as well), and it is insanely delicious. A soft bun, a juicy patty, plus bacon, lettuce, onion, cheese, and creamy sauce make this messy, greasy, and essentially perfect. From the team behind AnnaLena restaurant and Their There cafe comes a fun new burger concept called Hundy that opened in December. 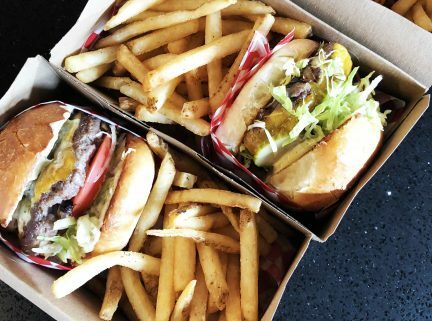 Located within Their There on West 4th, Hundy is an evening-only (and even then, just Fridays and Saturdays) burger joint whipping up some of the best fast-yet-quality options. Choose a regular burger with lettuce, or add cheese or bacon (or both), smothered in special Hundy sauce and washed down with a beer or glass of wine. Located opposite the cashier in its own little light-wood space—with comfy booths and old-school movies playing on a television mounted into the wall—Hundy is sure to become a staple of the Kitsilano area.